WILTON — Not all wins need to be flashy. 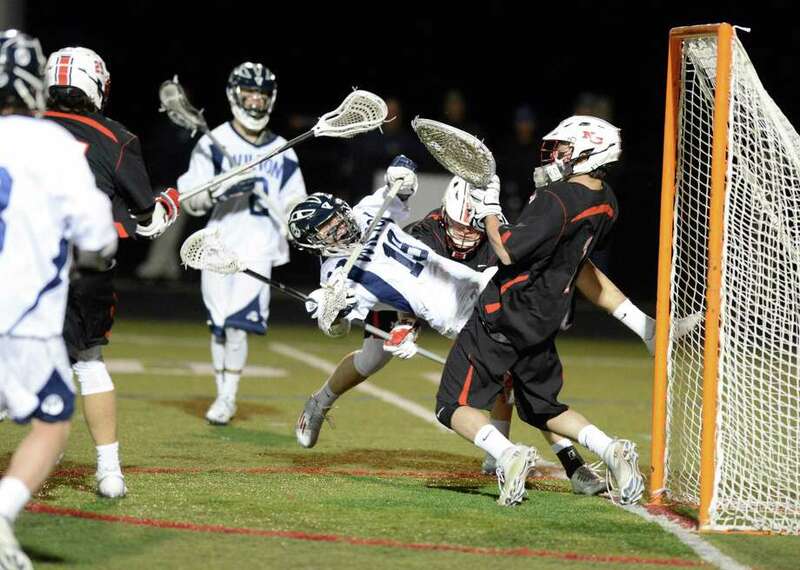 The New Canaan boys lacrosse team relied on a stifling defense in beating Wilton 11-2 on the road Tuesday night to remain undefeated. Wilton held the impressive New Canaan offense to just five first-half goals, but never could get anything started offensively. New Canaan, ranked 11th in the Under Armour/Inside Lacrosse poll, scored the game’s first three goals, two from Peter Swindell (three goals, one assist) and one from Kyle Smith (two goals) before Wilton’s Brian Calabrese tallied for the Warriors. From there the Rams (3-0) would score five unanswered spanning the second and third periods from five different players. New Canaan was extremely successful in hitting cutters to the net, creating easy point-blank opportunities. That midfield is what made a big difference for the Rams Tuesday as Buzzeo emphasized controlling the neutral zone. Wiseman agreed it was the little things that made the difference in Wilton’s first loss. “We weren’t executing well,” Wiseman said. Records: New Canaan 3-0; Wilton 2-1. Scoring: NC—Peter Swindell 3 goals 1 assist; Kyle Smith 2g, Matthew Bisceglia 1g, Ryan O’Connell 1g, Clayton Burt 2g 2a, Jack Hoelzer 1g 1a, Jonathan Betack 1g Jackson Appelt 1a; W—Brian Calabrese 1g, Kieran McGovern 1g, Peter Koch 1a. Goalies: NC—Drew Morris (7 saves); W—Matthew Brody (8).